‘The Teddy Bear Shop’ (just off Rundle Mall) handles repairs, as does The Adelaide Dolls Hospital. However, as it is the music box that is broken, even a watch repairer may be able to fix this for you, especially if it has simply been overwound. It won’t hurt teddy if he is unstitched at the place in his back where he was originally sewn up after stuffing. This small area could be unpicked to remove the music box for fixing. If it can’t be repaired, any of the teddy makers in the area could replace it for you with a new music box, and the seam easily resewn using ladder stitch. Google should be able to provide the names of makers or of a teddy bear show, if you need to contact a maker. I still have my pjama dog which I named “Biff” after a brand of dog food at the time. He’s now 52 years old. He’s white with a tan patch over each side of his face and ears. I remember the xmas I recieved him, when I was only a little girl, I loved him so much. Since then, he has hidden my secret items, stayed on my bed when I went flatting as a teenager, & has even out last two husbands! He’s still in one piece on my bed with our two cats! I still love him as much now as I did that very special Xmas many years ago. Would like to know if they are still available to buy? He is an older Jakas pyjama case, and so is quite collectable. We do still see them for sale occasionally, at collectors’ fairs, which may be harder for you to get to. Ebay is a good place to look too! Just search for ‘Jakas’ every now and again and you may see what you’re looking for! If it is possible for you to post a picture of him, we could look out for doggie pyjama cases for you, and let you know! My husband has a Jakas Toys doll with red and white label that says wash in lukewarm lux. I don’t know the correct term but he refers to it as a gollywog. It has black velvet face with red emroidery detailed features and a red gingham checked shirt and red velvet pants. The fur/hair is synthetic black I think. Do you know much about these dolls? Yes, your husband’s doll is known as a gollywog. Jakas made them between the 1960s and the 1970s, and by the label on this one, it is one of the earlier ones. They are well-made,and usually have a happy, smiling face, though we have seen them with ‘evil’ looks too! lol …maybe the person sewing the features on them that day was in a playful mood! They are quite collectable, and would sell at a collectors’ fair for around $60, or on ebay for $30-$40. I was given a Jakas Toys musical panda (white label embroidered in red) for my first Christmas (over 30 years ago), he was my favourite toy a (and best friend) as a child and I’ve since passed him on to my daughter (almost 4). Unfortunately “Teddy’s” music box died tonight and has left my daughter Phoebe distraught. Is there any way I can get him repaired, urgently. I can imagine that Phoebe is very upset tonight! The good news is that Panda can be fixed quite easily, with a new music box. Hopefully he played ‘Brahm’s Lullaby’ as this is a common music box tune. They can often be bought from a good craft shop. If you feel comfortable to repair him yourself, it is a matter of finding the seam in his back where he was hand sewn up after stuffing, then positioning the new music box where the old one was and then using ladder stitch to sew him up again. A teddy bear maker in your area could do this for you, though. I’ll see if I can find one in Hobart for you, if you can’t locate one. I’ve just looked at your web site with interest. I am sending you a photo of a small Jakas bear with label (Red on white – lux 1960’s); and after reading your info, I’m wondering whether the larger unidentified (unlabelled) bear in the photo could be a 1950’s Jakas? Can you tell from the photo if it is? The face is very similiar to the smaller bear. It is in great condition. I bought it at a garage sale years ago. It would be nice to finally know where it was made and how old it is…..What do you think? Hopefully the photo comes through OK. He was probably made as a shop display, and definitely in a very limited quantity. The label would date him to the 1970s. 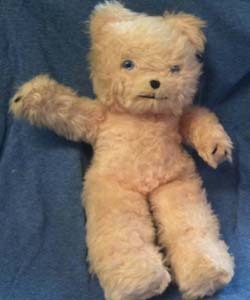 Collectors would be very interested in him as he is so unusual, and his value would be around $150 at a collectors’ fair. Yes, they are around the same age, 1970s-early 1980s. 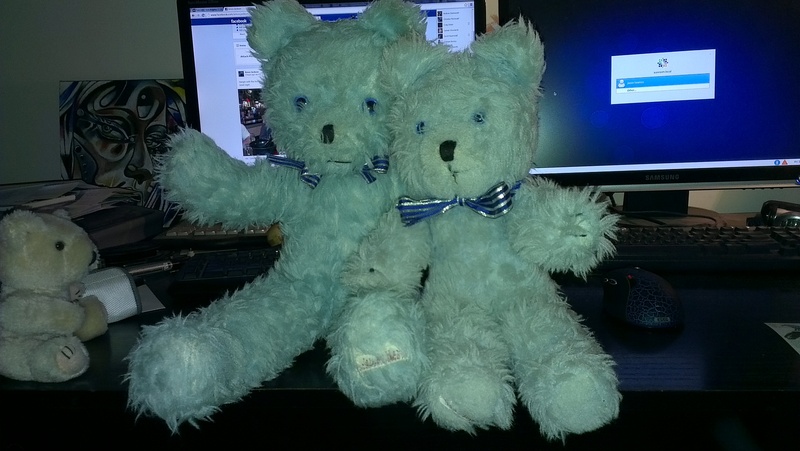 Love your two cute Jakas teddies! By their ‘look’ and the tag, both would have been made in the 1970s and so have the crumbed foam filling. We actually have the ‘twin’ of the caramel-coloured one! They are in lovely condition! They are quite collectable and would sell at a Collectors’ Fair for $25-$35 each. He is wonderful! I haven’t seen a Jakas panda in this big size before! It is possible he was made for shop display and in a limited amount. You are right in assuming he was made in the 1960s, and as he is in excellent condition, would sell at a Collectors’ Fair for $120-160. 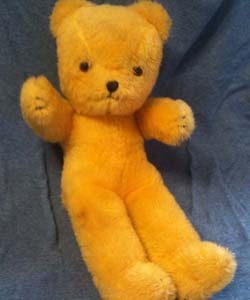 Hi, I have a Big Ted which is just like the one from Play School, and he’s been every bit as special to me as the one on TV. He’s in very good shape and has a label on his foot that says “JAKAS TOYS WASH IN LUKEWARM LUX”. I reckon he was given to me in the late 1960s. Did this model of teddy have a particular name? Thanks very much. It’s great that you still have ‘Big Ted’! I’m not aware that he has a particular name, other than a model number, though these teds are commonly referred to as ‘Big Ted’, thanks to the popularity of Play School! He is very collectable, and valued at between $90-$120, if sold at a collectors’ fair. 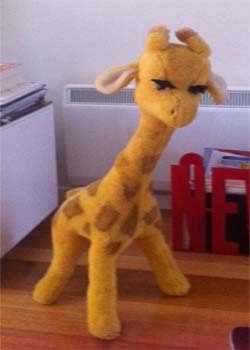 I have just unearthed my Jakas “Giraffe” which I estimate is 40-45 years old (I am 47 and got him when I was 3 or 4). I have passed him onto my new nephew with strict instructions to treat him well ! I’m wondering if you have any idea what he might be worth ? I have a Jakas Dog with a zip in it . Says wash in lukewarm lux on red label. Is this what u are looking for ? It maybe be of value to someone ? Your 1960s Jakas pyjama case poodle is very collectable. He is one of the older ones and appears to be in very good condition. His value if sold at a collectors’ fair would be $30-$50. You could try listing him on ebay, but values tend to be a little lower. I work as a volunteer for St Vincent De Paul and received three Jakas Teddy’s. One is beige 380cm, one is pink 480cm and the other is yellow 980cm. All are in excellent condition. The largest one has the label “Jakos Toys wash in lukewarm lux” the other two just “Jakos Toys”. As I want to get the optimum price for charity what would you suggest I advertise them for? I was thinking of advertising on e-bay. Thank you in anticipation. Sorry for the delay in replying-part of my home’s ceiling fell down! The teddies are all very collectable! The largest one sound especially wonderful, as this size is harder to find. He is also the older of the trio and could be offered for sale for $95 as a reasonable price. The beige teddy would be valued at $45 and the pink one at $35. Ebay is a good place to advertise as collectors use it to find what they are looking for. Thanks Jo, I will have a go on e-bay! Can you please tell me about my adorable pony walker that l have had since a child. My Mum sure knew quality when buying toys for us as children. My pony is in excellent condition. The saddle is intact however the bridle is missing. l just loved this toy as a child and my children have great enjoyment from it today. l’m not sure if l should be taking better care of it now that it is aging? Love your Jakas pony! He is in great condition, and is very collectable now. Teddy bear collectors like to use them to display teddies on! The company made a range of them in the 1960s, in two sizes, being walkers and pre-walkers, which were smaller. You are right in that your pony is of top quality workmanship, and so is very sturdy. Little children could still enjoy playing with him and not affect his condition, or if you chose to display him, he’d only need the occasional brush to keep him looking good! We find the old bristle clothes brushes are great for this job, and only cost a couple of dollars in op shops! At a Collectors’ Fair, your pony would sell for $70-$120. 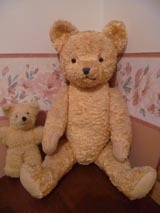 ‘Big Ted’ was made in the late 1960s, though a precise year is not known. So as to be machine washable, your teddy would be made of synthetic plush, with lock-in safety eyes, and stuffed with crumbed foam rubber. If he is the same size as Big Ted, his value would be $100-$150 at a Collectors’ Fair! 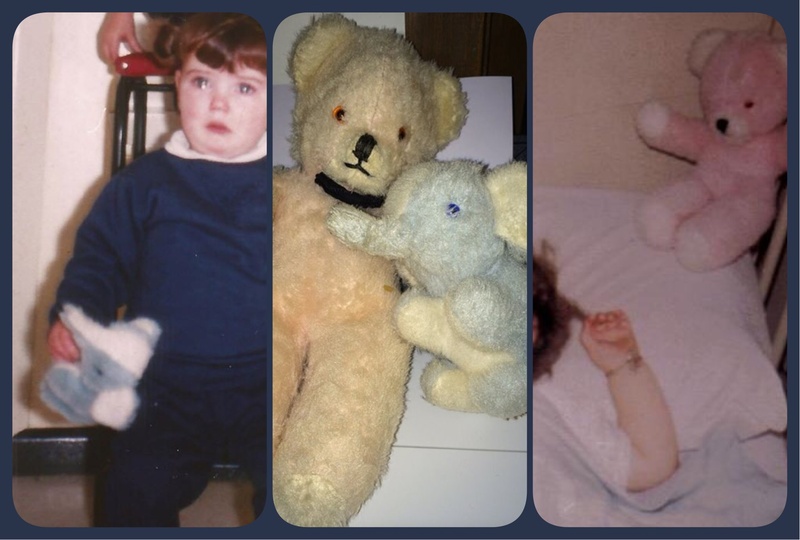 Thanks for posting your picture-a great group of teddies! Jakas teddies have the sweetest faces! You’ve done well to find so many. I have a disaster! My brother was recently staying in Melbourne and left his much loved jakas Teddy bear behind in the hotel room. No one can locate it and he is quite sad about it. He was given it soon after he was born in 1971. It was small, gold coloured, had quite short fur, not very fluffy. I am not sure whether the label read “jakas toys” or “jakas toys wash in lukewarm lux” or whether it was printed or embroidered. Do you have any ideas on how we might look for and find a “replacement”? here is me with my older brother I have the regular red white label whereas he has the wash in LUX label, so he must have been born in the 60s and I was born in the 70s. I think that I may be part of one of the largest collection of jakas bears in Australia with 25+ bears and even a horse! 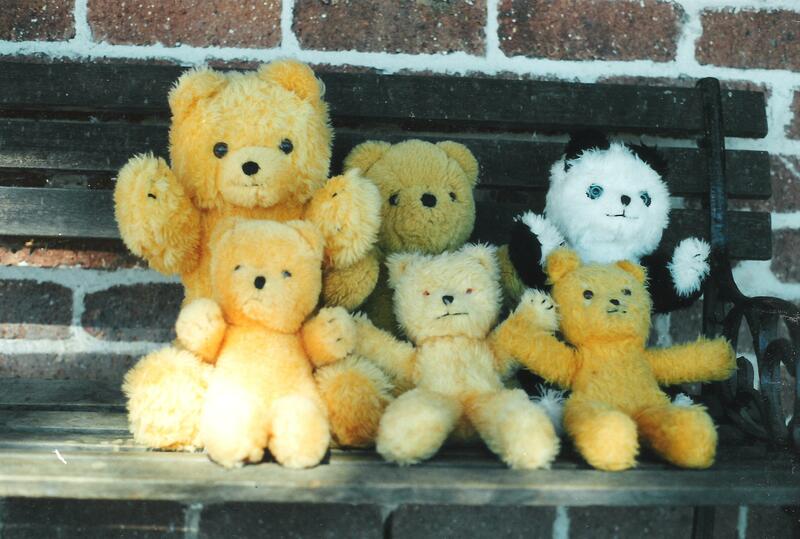 In response to Ingrid the small yellow pram teddies are very easy to find on ebay, in fact we have 4 of them living with us I think they are about 20cm or slightly smaller. 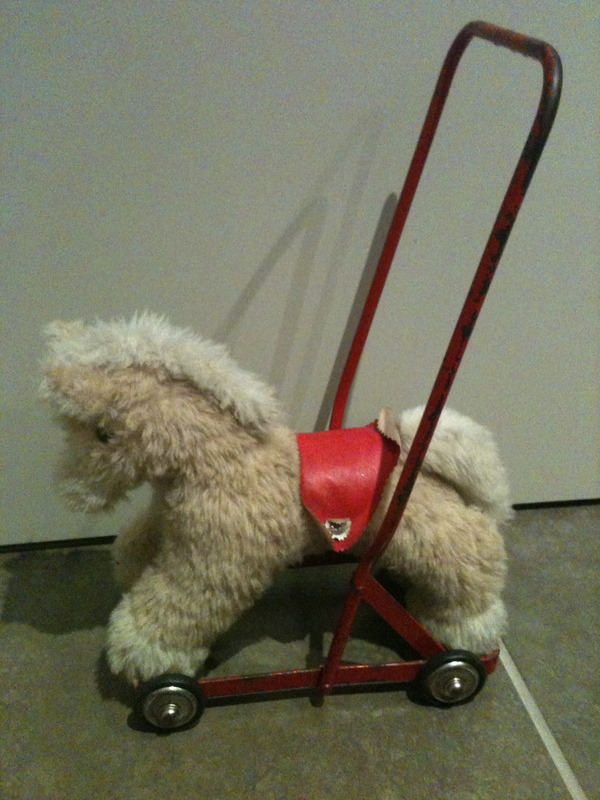 My father in law bought a wheeled dog for my son about 7 yrs ago. It is labeled with an embroidered Jakas Toys. Unfortunately, the dog’s head has opened up, so I’d like to get it repaired. Can you recommend anyone in the Melbourne area? I got this pair in 1969 and are both still dearly loved. Elephant has Jakas Toys wash in warm lux on bottom. No sign of label on teddy.